• A major exhibition looking at the role of gardens in the paintings of Claude Monet and his contemporaries opens at the Royal Academy of Arts in Piccadilly on Saturday. Painting the Modern Garden: Monet to Matisse spans the period from the 1860s to the 1920s and includes more than 120 Impressionist, Post-Impressionist and Avant-Garde works including 35 by Monet as well as “rarely seen” masterpieces by Paul Klee, Emil Nolde, Gustav Klimt and Wassily Kandinsky. Highlights include Monet’s Agapanthus Triptych (1916-1919) as well as his Water Lilies (1904) and Lady in the Garden (1867), Auguste Renoir’s Monet Painting in His Garden at Argenteuil (1873) , Kandinsky’s Murnau The Garden II (1910) and Pierre Bonnard’s Resting in the Garden (1914). The exhibition, which has previously been at The Cleveland Museum of Art in Ohio, runs until 20th April. Admission charge applies. For more, see www.royalacademy.org.uk. 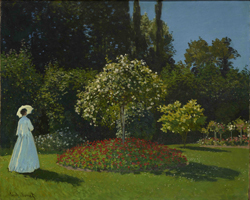 PICTURE: Claude Monet, Lady in the Garden, 1867; © The State Hermitage Museum/Vladimir Terebenin. • The world of professional tattooing is the subject of a new display at the Museum of London. Tattoo London, which opens at the City-based museum tomorrow, looks at the history of tattooing in the capital – which dates back to a time before Captain Cook – as well as life inside four contemporary tattoo studios. Also on display will be newly commissioned artworks by tattooists from the studios – Lal Hardy at New Wave, Alex Binnie at Into You, Claudia de Sabe at Seven Doors, and Mo Coppoletta at The Family Business. A series of events are being held in conjunction with the display which runs until 8th May. Entry is free. For more, see www.museumoflondon.org.uk. • A new photographic exhibition exploring the solar system has opened at the Natural History Museum. Otherworlds: Visions of our Solar System features 77 composite images pieced together from date collected on NASA and ESA missions by artist, curator and writer Michael Benson. Highlights include A Plutonian haze – a colourised image of Pluto created from data captured during New Horizon’s flyby of the dwarf planet in July last year, Enceladus vents waters into space – captured in 2009 by NASA’s Cassini mission it shows Saturn’s sixth largest moon Enceladus spraying water into space, and, A Warming Comet – a picture of the twin-lobed comet 67P/Churyumov-Gerasimenko venting gas and dust captured by ESA’s Rosetta probe in July last year. The exhibition can be seen until 15th May at the South Kensington museum. Admission charge applies. For more, see www.nhm.ac.uk/otherworlds.